Intrigued by LED string lights but don’t know anything about them? Tired of dealing with incandescent lights but don’t know of any other alternatives? Decorating and preparing for the holidays can be a bit overwhelming at times, so use this guide to see how and why LED Christmas lights are the more efficient and longer-lasting light sources for enjoying holiday lighting. One of the biggest advantages of owning LED lights over incandescent ones is the amount of energy they save. While a set of 50 incandescent lights use about 300 watts of energy, a set of 50 LED lights use only 4 watts of energy, meaning you can save up to 90 percent on your next energy bill while preserving the environment. Worried about safety? Built with solid, flameproof plastic non-breakable materials, you will never have to worry about leaving your lights alone anymore. Even after being on for a couple of hours, LED lights will never get hot like incandescent lights due to the material they are made out of. On top of that, LED lights contain no Mercury, eliminating all risk of toxic exposure. Like to save money? LED string lights last about 100 times longer than average incandescent lights, allowing you to spend some of that Christmas money you save up each year on presents rather than holiday decorations. Burn-out bulbs will no longer be a problem since LED lights typically have a 100,000 hour life span compared to 2,000 hours for incandescent bulbs. 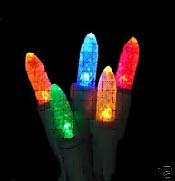 Along with saving you money, LED lights come in a variety of colors that help create that perfect holiday atmosphere. With colors like red and green, purple and blue, you have many options at your disposal. 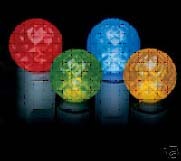 LED bulbs are also 10 times brighter than incandescent bulbs, allowing you to fully showcase your decorations to others.